Photo, left to right: Lee Wilson, Stewart Gillespie- Team Captain-Blair Murphy, Greg McLellan, Stewart McLellan, Ben Liddell, Jas Donaldson and Liam Haldane. 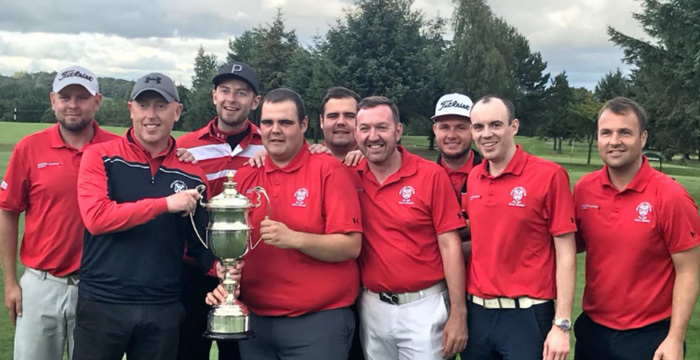 Stirling Golf Club Gents League Team -pictured-won the Stirlingshire Golf Union League on Sunday defeating the tournament favourites Glenbervie in a thrilling tense final at Bonnybridge Golf Club. Stirling quickly secured the necessary 4.5 points in the singles in the morning against Grangemouth GC setting up a match against local favourites Glenbervie. With the match tied at 3-3 Blair Murphy – a late replacement for the injured Roland Fleming – holed a testing 6 foot putt on 18th to earn a precious half match and half point. 2017 Club Champion Liam Haldane earned another half match to level the scores at 4-4. A sudden death play-off against both teams no1 players ensued. The in-form Greg McLellan and current Club Champion won the toss against Glenbervie’s Colin Mundell and elected to tee off first. Greg pulled the driver from the bag an launched a drive just off the back edge of the 369yard first hole. Colin was in trouble and Greg played a sublime chip to 3 feet and holed for a winning birdie 3 to win the Stirlingshire County League Championship Stirling last won the League in 2011. Team Captain Stewart Gillespie said “Huge thanks to all the squad of players, who participated in all the matches and Finals Day, everyone played their part, our sponsors Forth Plumbing, Heating and Adaptations, John Colquhoun Joinery, Howdens and Central Electrics, for their support and generosity and all the members who came out and supported the boys this season”. Greg McLellan made it a great week-end shooting a five under par 67 net 66 to win the Saturday Medal Finals Class1 and also qualifies for the Finals in 2019. Surprisingly despite a warm sunny day on Friday coupled with tremendous true rolling greens no Friday players made the prizelist. 203 players competed with the CSS 72 on Friday and 71 on Saturday. Greg made a solitary bogey at the 9th but was offset with six birdies at the 1,2,12,13,17 and 18th. Greg also stretched his lead in the Presidents Prize – best five gross scores over the season – and returns to Scratch status. Fraser O’Rourke was 2nd in Class one with a one over par 73 net 67 with birdies at 1,5, and 18. John Philliben recovered after a treble bogey 7 at the short 2nd hole enabled with some great driving and returned in one under par 35 with birdies at the 12th and 18th for 3rd place beating Bobby Sneddon, Iain Macfarlane and David Kernohan on the b.i.h. all scoring net 68. The ever improving Jay McEwan won Class2 and also being a Finalist won the Class2 Medal Finals with a net 66. Jay had a steady round in half’s of 40-39 including a closing birdie. David Morrison kept his run of fine form going taking second place on net 67 pipping Tom Watson on the bih. Iain Campbell won Class 3 and qualifies for the 2019 Finals with a net 68 pipping Stewart MacAskill and Grahame Cairns on the b.i.h. Iain’s highlight was an eagle 2 at the 2nd hole. Grahame was a Medal Finalist and his 68 earned the Class 3 Saturday Medals Final Winner. David Kernohan won Class 1 with a level par 72 net 68 and Qualifies for the 2019 Finals. David had birdies at the 5th 15th and 18th. Brendan Watt -a finalist- returned a net 69 to win Class1 Wednesday Medal Finals to narrowly beat Iain MacFarlane on the bih who had also qualified for the Finals. Brendan had birdies at the 2nd and 18th. Iain was 3 under par after five holes but had bogeys at 6,8,9 and 17. Congratulations to Scratch player David Oates had his first competitive hole in one the 8th hole with a crisp five iron and wins a Hugo Boss sponsored watch. David returned the best scratch score with a two under par 70. Brian Cree won Class 2 with a net 68 with birdies at the 8th and 13th. John Yuill was second on 68 with birdies at 3 and 14 and Course Manager James Lindsay third on net 70 with birdies at the 13th and 18th. David Morrison won Class 2 Wednesday Medal FInals with a net 75. Archie Young won Class 3 with a net 70, beating Murray Smith on ther b.i.h. the highlight a birdie 2 at the 14th. Michael Willis took 3rd place pipping Hugh Colquhoun on the b.i.h. both on net 71. Billy Blennie won the Class3 Wednesday Medal Finals with a net 74. This weekends players compete in a Texas Team Scramble format in the “Greenkeepers Revenge”. Teams are four players or three players who will receive a higher handicap allowance to compensate. Players can join teams – bookings online.